I’ve been slowly working my way through it. I’m about 4,200 words through chapter 3, which focuses on reusing test code. I have 3 sections left to complete—on test fixtures, inheritance, and the Test Hierarchy antipattern—plus a conclusion and an introduction. We’re going to start releasing regular alpha versions (minimally edited) on the testing-guide email list, rather than making everyone wait for the next chapter to be completed. “Release early and often” and all that. And we plan to watermark (as it were) the draft content so readers can easily identify which parts are new. Chapter 4 is planned to cover test doubles (fakes, mocks, and stubs), and chapter 5 will be about writing testable code. We’re putting together a public Perl Slack. We’ve also developed a self-signup script—deployed as a Perl CGI; and no, that’s not actually as 1990’s as it sounds. I’m looking forward to telling the whole story. 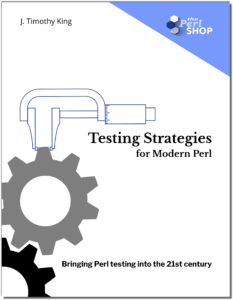 I’ve also got posts in my idea list (which my spellchecker is insistent about correcting to “idealist”—no, that’s not what I want to say) about training and coaching as alternatives to outsourcing and staffing, cool Perl 6 features, what excites me most about Test2, the 3 scopes of software testing, and our top N software development best-practices. I’m working my way slowly through videos of the talks from TPC 2018. Let’s talk more about Perl as an ecosystem, following on the “viability of Perl” post from last week, building on VM Brasseur’s excellent keynote. For now, Deven Corzine’s lightning talk, “Ancient Regex Regression” deeply entertained me.